The right technique of interviewing people for a job depends on the position you recruit for. The more advanced the position, the more complex and sophisticated your interview template should be). What is more, it depends on your interviewing skills (whether you can interpret the answers to some complex behavioral questions, the results of personality testing, etc). One way or another, you should remember that a bad choice of an interviewing technique (or an inappropriate application of a chosen technique, or a wrong interpretation of the answers of the job candidates) can easily result in a bad hire on your end. If you doubt your interviewing skills or are not exactly sure what to do in an interview after reading this article, consider seeking assistance of a recruitment agency, or at least a recruitment consultant. At the end of the day, working with an agency may prove cost effective for you. If they know what they are doing, a risk of a bad hire diminishes somehow (though we can never completely write off the possibility of hiring the wrong person). To have a simple template of interview questions that target the education, experience, and personality of a job candidate is a good technique for a majority of basic roles, entry level positions, and jobs in administrative or customer service. You ask a question and each candidate answers the question. Their answers should help you to understand their motivation, attitude, as well as communication skills. To understand which question is a good one, have a look at great questions to ask job applicants article. Bottom line: This is the most simple way of interviewing people for the job, and you can prepare for the interviews in no time. It has some limits, however, and won’t suffice for interviewing applicants for managerial or technical positions. If you hire for a managerial position, or for any role that requires some thinking and decision making on their side, it is good to use behavioral and situational questions. Asking about various work-related situations, you try to understand how the applicant will act in their new job, and what they really did before (anyone can write anything on their resume, but asking about particular situations from their past jobs or studies helps you to understand whether they are telling the truth on their resume, or just making things up). Bottom line: STAR interview and behavioral interview are the most common ways of interviewing people in big corporations in both United States and Europe. Answers to these questions tell you a lot about the job applicants, but they are harder to interpret than their answers to basic interview questions. If you hire for a technical position (programmer, maintenance technician, process engineer, etc), or for a leadership role (executive, department manager, branch manager), try to include some tests in your interview. An IQ test (you can find some tests easily online, or you can pay a company that specializes in IQ testing to prepare a customized test for you) will help you to assess the intelligence of the candidate, and a personality test (one you can interpret) will show you whether they have the right personality for the job. Practical tests and case studies will help you to understand the readiness for the job of the job seekers. What is more, you can observe their way of thinking and working (and also how quickly or slowly they do work) while they try to accomplish on a practical task, or try to solve a case study. Do they get nervous? Do they rush? Do they have a good system of work? You should take notice of such things…. Bottom line: Practical tasks and case studies are your best bet to assess the technical knowledge of job applicants, as well as their readiness for the job. What is more, people can hardly get ready for them in advance, and they will have to react on a spot. The drawback of this interviewing technique is that it takes time to design this interview in a right way, and it can be sometimes difficult to compare individual job candidates at the end of the interview session. It is also harder to schedule the meetings, since we can’t really predict how long it will take to complete one session with an applicant. An alternative way of hiring new employees consists in a test day, or in a practical interview. For example, if you try to hire a new graphic designer, you can assign a design project to all candidates who sent you their job application. Their task can be to design a new logo for your company, or it can be something more complex. Only people who are serious about the opportunity will agree to do the work upfront–this will help you to screen out those who do not really care about your offer and company. Then you can compare the designs, and invite two or three people with the best works to the final interview with you. An even more extreme (and straightforward) interview technique consist in a “test day”, or a “test hour”. It is a great hiring technique for restaurants, fast food chains, language schools, etc. After a short talk with the candidate (checking their references, experience, education) you let them to work for you for one day (you will pay them for this day in job, but you’ll sign just a very simple contract for a day, or you do it without the contract). Let them cook, or serve the customers, or teach one lesson. Observe how they carry out the assigned duties, how they talk to the customers, and ask other employees to provide feedback on their attitude to work. Of course you should not expect them to be super fast and effective (it is their first day in work after all), but how they work and act (and deal with a pressure of the first day in new environment) should help you to decide whether it makes sense to hire the person or not. Bottom line: Nothing tells us more about someone’s ability to handle the job than actually letting the person to do the job. Practical interviews or test days are not as common as other forms of hiring new employees, but “the results” of them are clear and easy to interpret. To recruit a new employee is not easy, and mistakes are plentiful. 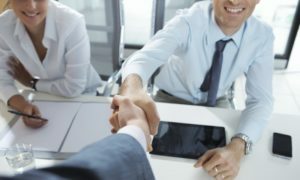 A good interviewing technique will help you to save time and money, and to minimize a chance of a hiring a bad person for the job. Choose one of the techniques, or combine more of them in your interviews, or hire a recruitment consultant to help you with the task of hiring new employees. People are not only the most essential part of every business. They are the business. Prepare well for the interview, and ensure you’ll bring the right people onboard. Funny interview questions – You can use a funny question to ease the pressure in the interview room, to help job seekers to relax, or oppositely, to surprise them with an unexpected question. How to conduct interviews – A simple three step guide on conducting an interview, suitable mostly for small business.